Smartphone users spend almost 90% of their time on devices using mobile apps. Apps offer an incredible opportunity for brands to connect with customers. We have an iPhone, iPad and Android mobile application for you and your customers to use to submit reviews and Q&A from anywhere. Your employees and customers can also record video testimonials, quickly and easily with any mobile phone, tablet or laptop. We provide you a mobile app completely under your brand, Rating System will not be advertised or revealed in any way. Video testimonials provide evidence that you actually do solve customers problems. It's a great way to bring positive online reviews directly to your potential customers. You will truly see its affect on customer relations with the product and/or service. We believe video reviews to be the most authentic proof of what your customers think about your company, products and services. Your customers video testimonials are the perfect opportunity to harness the power of stories. Future employees want to hear stories from current and past employees, and potential customers want to hear stories from current and past clients. Your customer just made a purchase. Now you start focusing on retention, customer loyalty, up-sell and cross-sell. Our Follow up Email Marketing can help you build your business after the sale. It helps you learn whether your customers are happy with their purchases, associated services, pricing, and encourages future purchases. It is also an opportunity for your customer to spread the word about deals to their friends. We ensure there is continuity between your site and your post-purchase emails. We provide you different email templates, completely customizable with mobile first approach. Incentivize your customers to leave a review, you are gaining a valuable review, as well as increasing the chance they will come and spend with you again. Think outside the box, if there’s a 10% off discount you’re willing to offer for a limited time. This is a really great tactic. Customers are likely to be more willing to leave feedback and you are inadvertently encouraging them on in their customer journey with you. You are gaining a valuable review, as well as increasing the chance they will come and spend with you again. Use post purchase email to promote loyalty scheme, that offers a discount if they introduce friends to the brand. Rating System is the ideal partner to help you manage your online rating and reviews and create profitable customer relationships for your business. A "Verified Buyer" review means RatingSystem has verified that the person writing the review purchased the product or service. A "Verified Buyer" submitted review through a specific process that clearly identifies those members who are submitting reviews of products that they own or services that received. These reviews come with a small "Verified" badge. This means we have confirmed the person reviewing it. Reviews that are not marked "Verified" are valuable as well, but we can't confirm that the product or service was purchased. Once a customer purchases a product or service, an email will be sent out within 7 days - a request to provide review for recent purchase. Seven days is the most common delay before sending these follow-up emails, but you can choose different delay up to 45 days in our system if your delivery process requires that. 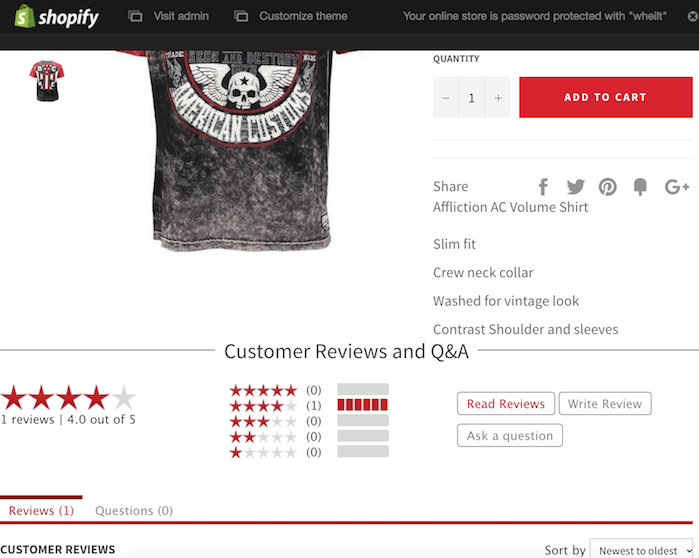 If you allow anonymous reviews, display a badge indicating "Verified Buyer" and provide extra transparency to your product reviews. 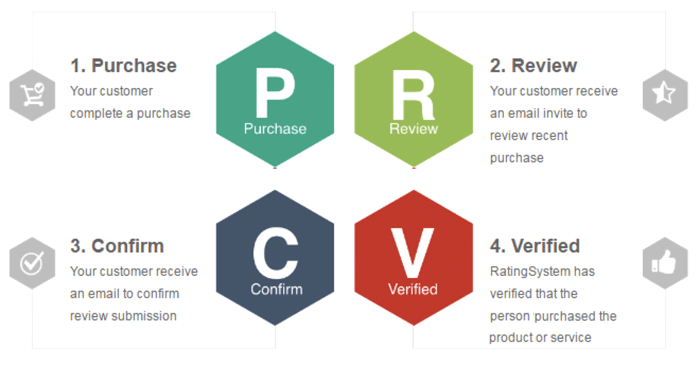 Verified buyers are asked to fill out a review via email and are taken to a page where they don't see any other reviews and aren't influenced by the reviews of others. Our study shows that average star rating for reviews from verified buyers is 4.5 compared to 3.6 for reviews written anonymously. BTW reviews from anonymous customers have a larger percentage of one star ratings, anonymous customer more likely to give an even lower rating that they would initially to bring the overall rating down. Our study shows that more positive reviews are correlated with greater likelihood of purchase, and reviews from verified buyers are more positive overall. Our "Verified Buyer" functionality is made with mobile in mind. Our Follow-up Email Marketing is the most efficient way to get your customers to write reviews about your products or services. We automatically send a review request to your customers at the perfect time after purchase. This request email is totally customizable and mobile friendly. For Follow-up Email Marketing to work, you need to install the order tracking code on your website. ProductCode: The code that identifies the item that was ordered. Depending upon your website platform, most systems have a global area to add code that will install it on your website checkout page. Contact your webmaster for additional setup assistance. Followup email is the first step to getting more reviews on your site, increase conversions and generate more traffic.